Red Right 88, The Drive, The Fumble, The Shot, The Move, The Sweep, The Decision, The Injuries, and the two times the Indians failed to win the World Series were events that become a part of Cleveland sporting lore for all of the wrong reasons. Cleveland sports fans were the equivalent of Charlie Brown having the ball yanked out at the last second by Lucy Van Pelt. All of that came to end when the Cleveland Cavaliers finally broke the 52-year drought on Sunday night when they beat the Golden State Warriors in dramatic fashion. What made this win so remarkable and memorable was the fact the Cavs were the first team in NBA history to come back being down 3 games to 1. I and many others thought the Cavs were dead after getting blown out in the first two games. None of the sporting pundits thought the Cavs had a chance. They were ready to write yet another eulogy to long-suffering Cleveland fans. Whether it was the Warrior's arrogance or the Cavs started to believe in themselves, the series started to shifted when Warrior's Draymond Green got suspended for punching the King's family jewels. Without their emotional leader, the Cavs won the game on the road and headed back to Cleveland where the city erupted as the Cavs forced a game 7 and the momentum was shifting. "It's over, it's over, Cleveland is a city of champions once again, the Cavaliers are NBA champions!!!" For many in Northeast Ohio, this was the first taste of victory, nearly every Clevelander can tell you where they were when the Browns, Cavs, and Indians all failed to win. It was past down from generation to generation. This victory washes all of the negativity that plagued the area for decades as it was ridiculed and made fun of. Now all of those failures can be tucked away and forgotten as the city will celebrate this special victory. 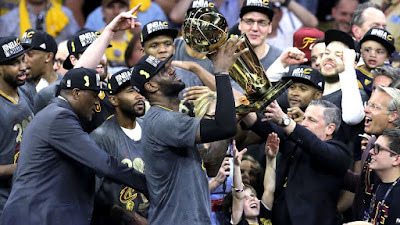 LeBron James cemented his legacy as the prodigal son who once left and was scorned, came back with a promise to bring a championship back to the area where he grew up. Last year, he fell short as he carried the team on his shoulders when both Irving and Love were injured. He delivered with 3 amazing games and his game 7 performance will go down as one of the greatest. We were all witnesses.